TRIUMPH went so far with the TT600, a brave move in to the ultra competitive world of the Japanese 600cc supersports class. But just hadn’t quite got it sewn-up until now. There’s plenty of horror stories about breathless, wheezing, coughing TT600s. Well this model for 200 ain’t one of them. Try as hard as you like and you can’t make it cough. Step off an R1 or a Daytona and it feels breathless but then you remember this is a 600 and that’s how they feel. In the company of an R6 or current GSX-R600 it would get left behind in a straight line but not by light years. The engine has some new internals, what they are exactly Triumph ain’t saying but along with new mapping on the fuel-injection system the bike breaths like a professional 100 metre swimmer. I couldn’t wait to get on the TT600 because I’ve ridden them since the bike’s launch a couple of years ago at Circuit Pau Arnos in France where I almost stalled leaving the car park because of the bike’s low down cough. On this one, fire it up and it doesn’t sound sweet, a bit rattly but nothing to worry about, and the tickover seems to be set a bit fast. But put it in gear, let it warm up a bit then pull over to the side of the road. Let the clutch out and drive the throttle all the way round and it pulls cleanly without stutter. Picks up at 6000rpm, then when it gets to 10,000rpm it even picks its front wheel up without any help except the throttle pinned to the stop. Ride it through the rest of the gears and the buzzy little four-cylinder motor pulls cleanly and revs quick enough. 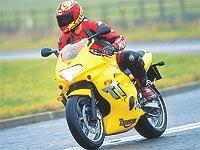 Drive from 70mph in top gear requires a downchange, but don’t all 600 sports bikes. Accelerate from 100mph in top gear and it goes like a good 600 should. The chassis remains untouched except for the frame and swingarm now coming in silver along with the footrest hangers. That means the already competent, sweet handling TT600 handles like it always did. The riding position has never felt fluid to me. Somewhere between a CBR’s handlebars with higher footrests but the chassis is hard to fault. It turns quickly, yet it’s stable and feels sharp right to the edge of the BT010 tyres. And it’s easy to forget just how good the TT600’s brakes really are until the first time you use them in a while. Essentially the calipers are made by Nissin with Triumph logos and are the same as the ones used on the Daytona but with smaller discs. Pulling up less weight than the Dayton the brakes are absolutely mind-blowing yet don’t owverpower the set-up of the front-end even in the slimey wet roads we’ve been having recently. But the chassis and braking has never been a problem on this bike, only the engine and that seems to have been pretty well sorted too. And just so you know. The black plastic air intake tubes on the front fairing are now colour matched and a jet black colour has been added to the TT600s colour options.